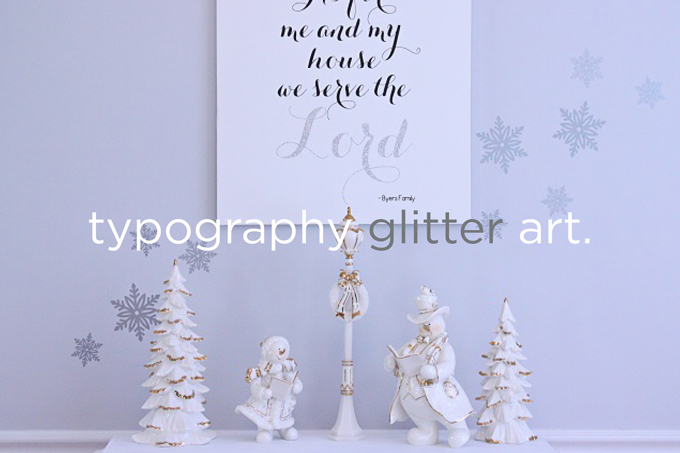 I have a love for glitter and typography. Today I want to show you how to combine the two into beautiful canvas art. Hi everyone! I’m Kim Byers of The Celebration Shoppe. 1. Design – if you’d like my “As For Me And My Family We Serve The Lord” design, download it and upload it to Cricut Design Space. Simply delete my family name and add your own. Or, you can create your own design in Cricut Design Space. To size your design, measure your canvas and create a square the size of your canvas in the tool to make sure you’ve centered and sized your typography well. Before you cut, just hide the background shape. 3. Cut – read the directions on the package and mirror image any additions you make. If you use multiple colors like I did, make sure you click mirror image before each cut. If you can’t see it, flip back to the design and select cut again. The mirror image button should appear. 4. Weed – weed out all the iron-on that isn’t your image and place on the canvas to make sure spacing is good. 5. Iron – iron your canvas (with a towel under it to help it hold its shape) to heat up the fabric, place the image with liner on top, iron in 15 second intervals. Don’t be in a hurry. 6. Remove liner – gently pull liner away. If any of the design comes up, repeat ironing step and try again.